Ideal for both start-up and established business, there are a large number of office spaces offered on fantastic terms close to the M1 in Barnsley. Offices are rented on an all-inclusive basis and have access to meeting and conference facilities. A range of rental options are available including single desk space and virtual offices. Barnsley has a range of places to eat and drink, as well as shops, banks and hotels. Strategically located just off the M1 motorway with Barnsley town centre just a five-minute drive away these individual business units range from 90 to 1,500 sq. ft. set in an attractive landscaped environment. Extremely flexible office space is available, suitable for all business types. The offices are modern and fully furnished, and a facilities management team and reception are located on-site. Convenient for transport links, the area is close to local shops and businesses, three miles from the centre of Barnsley. The town's well-placed Railway Station offers direct services into both Sheffield and Leeds. Managed offices and workshops are offered for rent in an ideal location a mile from the centre of Barnsley. The offices provide flexible work spaces suitable to any size of business in a professional area close to local transport routes. Housed in a renovated 19th century quilt factory, this centre offers you the chance to add a little bit of history into your working day. With full concierge and reception service for all tenants - including postal handling - the centre does all it can to ease your stress throughout the day. 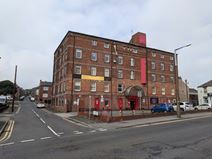 There is also 24 hour access, plenty of nearby parking, and with the centre just minutes away from Barnsley town centre, opportunity to make use of the town's wealth of amenities.